Listen to the podcast. Find it on iTunes/iPod and Podcast.com. View a full transcript or download the transcript. Sponsor: Hewlett Packard. 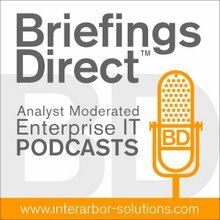 Our latest BriefingsDirect podcast uncovers how to quickly harness the technical benefits of current data centers for cloud computing approaches. We examine how enterprises are increasingly focused on delivery and consumption of cloud-based infrastructure and services. Yet much of what makes the cloud tick is already being used inside of many data centers today. So now we'll examine how many of the technical underpinnings of cloud are available now for organizations to leverage in their in-house data centers, whether it’s moving to highly scalable servers and storage, deeper use of virtualization technologies, improved management and automation for elastic compute provisioning, or services management and governance expertise. Here to help us better understand how to make the most of cloud technologies are four experts from Hewlett-Packard (HP): Pete Brey, worldwide marketing manager for HP StorageWorks group; Ed Turkel, manager of business development for HP Scalable Computing and Infrastructure; Tim Van Ash, director of software as a service (SaaS) products in the HP Software and Solutions group, and Gary Thome, chief strategist for infrastructure software and blades at HP. The discussion is moderated by me, Dana Gardner, principal analyst at Interarbor Solutions. Van Ash: When IT looks at becoming a service provider, technology is a key part of it, architecting yourself to be able to support the service levels around delivering a service, as opposed to some of the more traditional ways that we saw IT evolve. Then, applications were added to the environment, and the environment was expanded, but it wasn’t necessarily architected around the application. When IT moves to a service provider role, it's as much about how they structure their organization to be able to deliver those services. That means being able to not only have the sort of operational teams that are running and supporting the application, but also have the customer-facing sides, who are managing the business relationships, whether they would be internal or external customers, and actually starting to run it as if it were a business. ... It’s also about realizing that it's not just a cost model, but it is very much a business model. That means you need to be actively out there recruiting new customers. You need to be out there marketing yourself. And, that’s one area that IT traditionally has been quite poor at -- recognizing how to structure themselves to deliver as a business. When you start to move into cloud environments, which feature, in many cases, high levels of virtualization, you start to decouple those layers, as the service provider has a much stronger control over what the architecture looks like across the different layers of the stack. This is really one of the areas where cloud [can] accelerate this process enormously. Brey: Now, not only do you have your scale-out compute environments, you need to also pay attention to the storage piece of the equation and delivering the platforms. The storage platforms need not only to scale to the degree that we talk about into the petabyte ranges, but they also need to be very simple and easy to use, which will drive down your total cost of ownership and will drive down your administrative costs. They also deliver a fundamentally new level of affordability that we have never really seen before in the storage marketplace in particular. So these combination of things, scalability, manageability, ease of use and overall affordability, are driving what I consider almost a revolution in the storage marketplace these days. Turkel: In those [cloud] environments, the way that they look at management of the environment, the resilience or reliability of individual servers, storage, and so on, is done a little differently, partially because of the scale of the environments that they are creating. If you look at many of the cloud providers, what they've done is they've implemented a great deal of resilience in their application environment, in a sense, moving the issues of resiliency away from the hardware and more into software. When you look at an environment that is as large as what they are doing, it's somewhat natural to expect that components of that environment will fail at some level of frequency. Their software infrastructure has to be able to deal with that. ... The way that [enterprise IT] service -- and the way that they design -- the environment has to be somewhat similar to those cloud providers. Thome: When customers are thinking about going to a cloud infrastructure or shared-service model, they really want to look at how they are going to get a payback from that. They're looking at how they can get applications up and running much faster and also how they can do it with less effort and less time. They can redirect administrative time or people time from just simply getting the basic operations, getting the applications up and running, getting the infrastructure up and running for the applications, to doing more innovative things instead. ... Unlike the cloud that Ed was talking about earlier where they are able to put things like the resilience and scalability into the software, many enterprises don't own all their applications, and there are a variety of different applications on a variety of different operating systems. IT has to look at working with the CIO or senior staff within the enterprise IT infrastructure, looking fundamentally at how they change their model of how they deliver their own IT service to their internal customers. Rather than just providing a platform for an application, they are looking at how they provide an entire service to their customer base by delivering IT as a service. It's fundamentally a different business model for them, even inside their own organizations. ... We're also seeing some interesting crossover from another part of our market that has been very traditionally a scale-out market. That's the high-performance computing (HPC) or technical computing market, where we are seeing a number of large sites that have been delivering technical computing as a service to their customers for some time, way back when they called it time sharing. Then, it became utility computing or grid, and so on. What we're seeing from customers is a demand for existing enterprise tools to expand their role and to manage both private cloud and public cloud technologies. ... One of the most exciting examples that I have seen recently has been taking the enterprise technology around provisioning of both physical and virtual servers in a self-service and a dynamic fashion and taking it to the service provider.